Only the disc drive, 1 GB drive, cables, AC adapter, and carrying case is included as displayed in the photos. The disc drive may have residual dust and/or scuffs from previous use. Tested and working: item was powered on and observed to work. SyQuest EzFlyer 230MB ~ PC Formatted. The process of sparing permits a read/write of a known bad portion of the disc to be redirected to another location set aside with spare sectors reserved for this specific purpose. 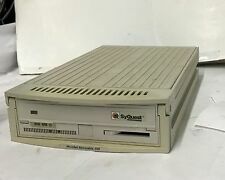 Syquest SPARQ1AIC. Internal SparQ 1.0 GB. Drive Only. Model # SPARQ1PE. Launch your creativity to new heights with a new SparQ 1 Gigabyte drive! a power cord with A/C Adaptor. Makes an excellent backup solution for entry-level to mid-range servers and high-end workstations. Purchased from an estate sale. Not tested. Great physical condition. Free shipping. Material: Plastic. Material: Electronics. Color: Gray. Country of Manufacture: Unknown. Feature: 650 Floppies. Feature: 1000 Pictures. Feature: Version 003. Pick up at our location after purchasing on this site. 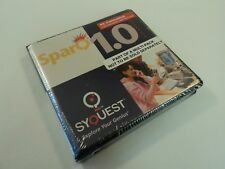 Syquest Sparq 1.0 GB PC Formatted Disks ( You will get two ). After all, that’s what we are here for! International Orders (When Applicable). Confirmation is available on your order details page! SparQ 1.0 GB External Removable Cartridge Hard Drive - Parallel Port NEW IN BOX! New in box - box has been opened, however, all parts have the original wrapping and large plastic container has never been opened. Capacity 1.0 GB. Easy to Install. Material: Plastic. Material: Electronics. Color: Gray. Country of Manufacture: Unknown. Feature: 650 Floppies. Feature: 1000 Pictures. Feature: 100 Minutes of Audio. Feature: UPC 742078001007. Material: Plastic. Material: Electronics. Color: Gray. Country of Manufacture: Unknown. Feature: Part Number: 113312-001. Feature: UPC 742078001014. Batch: 021015. If an item cannot be tested or is partially tested the details will be listed with the Item Actual Operation details. We are here to take care of ALL your Computer & electronic needs. With no EPA regulation in these countries the toxins are contaminating the land, air, and water. 20E-8 2-23-19. Model SPARQ1PE. Used SYQUEST SparQ 1.0 GB External Drive Parallel Port. Compatible Windows 3.1, Windows 95, Windows NT 4.0. Good used working condition. No power adapter included. High Capacity : 230MB Formatted. Hello. I am listing this as used however when I opened the unsealed case it appears that it has not been used. I ship fast. Thank you. Syquest Spar! Style: Pc Formatted Discs. You can reach us at. We will respond during these hours. All attempts are made to represent each item in an honest and forthright manner. Part Number: 113312-001 RevA. 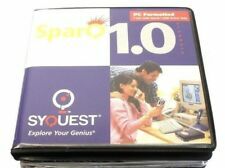 SyQuest SparQ - Disk drive - SparQ ( 1 GB ) - IDE - internal - 3.5" - New!